I’m from the small town of Wheelersburg, Ohio. 1. I’m an artist/photographer so much of my time is spent photographing or creating new art projects. 2. Listening to the Chicks. Whether it is on Vinyl, CD or Cassette. I have each of their albums on each format and enjoy listening to them over and over again. 3. Online shopping. I’ve went through much of EBay and Amazon in search of the perfect, vintage Dixie Chicks memorabilia to add to the collection. I am currently a senior in high school on the verge of graduating in the next couple of months. I am planning to attend Columbus College of Art and Design in Columbus, OH, majoring in Photography in the fall of this year. I have seen the Chicks twice. Once when I was seven, my first concert, at the Value City Arena in Columbus, OH on July 23rd, 2006 during their Accidents and Accusations Tour, which is really an interesting story because directly after the Chicks’ photographer had taken photos of me and my shirt he had went and shown the girls and they were so tickled to death by it that they decided to give myself and my Mamaw two front row seats to the show after at first being in the nose bleed part of the arena. Best moment of my entire life. And again during their recent MMXVI tour in Cleveland, OH at Blossom Music Center, Ten years later at the age of seventeen. I’ve been asked many times how and why the Dixie Chicks mean so much to me and I never can come up with just one reason of the many I have. At the young age of two I was given a CD player and two of the Chicks’ CDs, Wide Open Spaces and Fly by my Mamaw, I remembered all of the lyrics and performed them as a baby for all of my family’s entertainment. These moments created my passion and love for the Chicks that I never thought would continue for the rest of my life. But nothing made me more proud or more in love with Natalie, Martie and Emily until I learned more thoroughly of their bravery and the sacrifices they made when they chose to speak on a topic so sensitive to the American public. Shut Up and Sing remains to be my all-time favorite film because it so profoundly represents the strength and courage the girls went through together. The girls never abandoned their friendship and sisterhood that has stood a lifetime of trumps and trials. To be a Dixie Chicks fan means to stand for what you believe in, spread peace and love and always choosing what’s right over the opinions of the people around you. By expressing my love of the Chicks to everyone I come into contact with (literally). Whether it be jamming to their music so loud that it blows out through my headphones for all to hear or just wearing my Chicks gear around town. The Dixie Chicks stand the test of time. They were the only band at that time, specifically in country music, that stood out and expressed their opinions of the violence that was surrounding our country. They are strong, powerful, beautiful women who created music that rocks my heart and soul to pieces and has to countless others who choose to give their music a chance. Anything from Beyoncé’s Lemonade of course because she’s the queen but The Chicks take the number one spot above any other artist I listen to on a daily basis, specifically any Taking the Long Way tracks because it’s my favorite. Not Ready To Make Nice. This song for me is so powerful. It expresses the many emotions that occurred between the girls and how they needed to write and perform this song to get through their anger and pain. The song transcends beyond the incident that they went through and has for me been an anthem that I listen to when I’m in complete anger, sadness or any form of emotional pain. This song has gotten me through some pretty rough patches and I’ll forever be grateful for it. Taking The Long Way, hands down. This album was spectacular. This album was so powerful and heart wrenching that it even made those who were not fans previously become entangled in the beauty and madness of this album. Taking The Long Way has always been my favorite album and has given me multitudes of inspiration. Social media. Typically Instagram, Twitter and Snapchat. I have Natalie and Emily on notifications mode on twitter and the Chicks Instagram account on notifications as well so I am able to see all of the fun and best political banter from Natalie, always brings joy to my day. God, every DCX thing I own I suppose. But aside from the material things what I have treasured for many years is the love I have for these girls and that I always will have for these girls in my heart which overpowers any material memorabilia that I own. 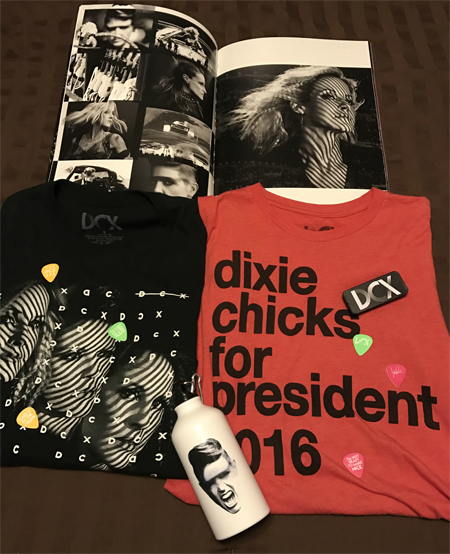 You can also get your official Dixie Chicks merch HERE! Yes I attended the Cleveland, OH show on June 3rd, 2016 at Blossom Music Center with my Mamaw who happens to be my run to Chicks fan and concert buddy. I wish to attend more as they come into play. Definitely the Cleveland show over this past summer. From where I live to Cleveland was about a six to seven hour drive with stops in between. The Dixie Chicks are the most real, honest, kind and beautiful people in the world. They are so open and loving to their fans and especially to the ones who refused to ever turn their back on them. Thank You. Thank you for allowing me to understand the rights to free speech, for making me feel brave and for teaching me that doing what’s right is always the most important part of any human’s life. Thank you for granting me the magic and beauty that is your music that has stood the test of time. And above all else, thank you for being there for me in my darkest moments. Thank you for making me feel that all three of you are a part of my family and of my life. I’ve never had a connection beyond just liking a band until I was introduced to you by my Mamaw at the young age of two and I’ll never forget that as long as I live. Natalie, Martie and Emily this is for you. I will forever and always love you, to the moon and back. You can follow Jerry on Twitter @JerryWeaver1998 and Instagram @jtweaver1998.